Ciprian Borodescu - Page 3 of 5 - CEO at Appticles, Founder at MorphL, Co-Organizer at BucharestJS & JSHacks, altMBA Alumnus. Love to play tennis. 2015 is just around the corner and every year, during the Winter holiday, I make a short review of the passing year. 2014 was in fact a great year, with a big focus on Appticles – this was made possible right after we got the investment from Launchub. Imagine that, no more outsourcing! We went all in with Appticles and this really paid off: we’re now generating revenue and we have awesome opportunities laid out for 2015. But don’t think this was an easy journey. It never is and in fact, more often then never, it only gets tougher when growth is involved. 2014 was unique from a personal perspective as well, in the sense that I became aware of my intense need to self-discovery. Jim Carrey had a speech earlier this year where he said: “The effect you have on others is the most valuable currency there is!“. This stuck with me and made me think about all the people that I met in the last few years, that had an impact on me, either from a personal or professional point of view. It’s a privilege to be on the receiver’s side, to get to meet inspiring people, learn from them and hopefully, one day, being able to give that back to others. Personally, I look at 2015 with excitement because I know that it represents the beginning of a new journey, sprinkled with uncertainties and things that are there but waiting to be unraveled. This is the stuff that gets me all hyped up! A Big New Year Hug to all of you out there and a very special wish: may 2015 be the year of discovering the impact that YOU have on others! Almost a month ago I wrote this article on Medium.com and I’d like to invite to go over it and let me know your thoughts. Here’s just an extract from it. According to the International Data Corporation (IDC) Worldwide Quarterly Mobile Phone Tracker, vendors shipped a total of 1,004.2 millionsmartphones worldwide in 2013, up 38.4% from the 725.3 million units in 2012. In addition to that, tablets will rise to break the 300 million unit mark in 2014 (combining tablet shipments of 263 million and shipments of “other ultramobiles” of 40 million units). These two numbers are critical for understanding the driving force behind the third important trend: according to ComScore, mobile users will surpass desktop users in 2014. It’s pretty clear that together with smartphones & tablets, apps are driving people’s interactions. Applying this to the Web translates into the need to escape the page view zone and think beyond responsive web design for all those 1 Billion web sites out there. There’s a new layer to be added to the mobile web, and that’s not only responsiveness, but “appness”. 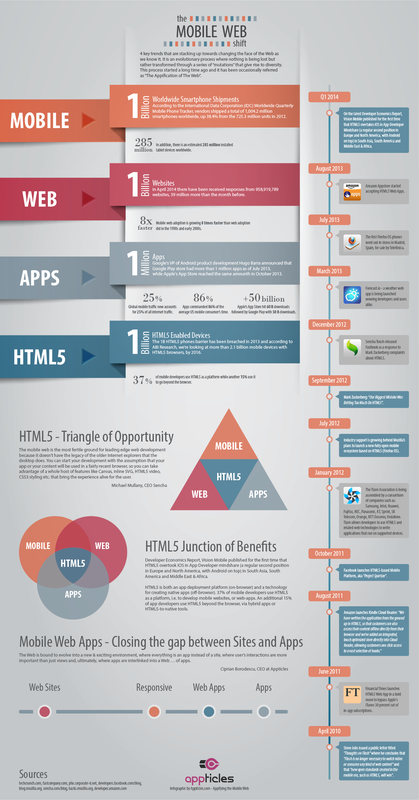 If we admit that on mobile everything is about apps and considering the HTML5 adoption trend, then we could expect the Web to evolve into a new & exciting environment, where everything is an app instead of a site, where user’s interactions are more important than just views and, ultimately, where apps are interlinked into a Web … of apps. Spain, Barcelona, 2013. Said to be a wonderful city, never been there and honestly didn’t know what to expect other than practicing the Spanish I used to know from watching too much soap operas back in high school. In any case, never thought of Barcelona as the world’s capital of mobile, the place where, for a week, everything gravitated around devices, gadgets, operating systems, apps, opportunities and people of all nationalities united under one single but conclusive word: mobile. So, all of the sudden Sagrada Familia and Mobile World Congress was a mix that stuck with me the entire week while I was in Barcelona and while I could go on and on about the two, I would just like to say a bit more about the rest of the things that I did there including pitching Appticles.com at Mobile Premier Awards in front of a jury from Mozilla and Intel. This was an interesting experience and I have to say that being the first one to pitch out of 20 finalists gave me the opportunity to be more relaxed afterwards and enjoy the rest of the show. The next day, I’ve pitched at Barca Starta, an event organized by Mobile Marketing Magazine and that was held in a really nice venue and on the third day it was time for me to be in the audience and see 7 startups pitching on stage at Telefonica Tower after going through the Wayra program. All in all the Wayra BCN Demo Day was a good show, although I personally was expecting more from some of the startups that got accelerated for 6 months. The last day in Barcelona was all about visiting stuff: Sagrada Familia, Camp Nou and La Boqueria. But because I had so little time for visiting, I’ve just promised myself that I’m going to be back in the summer time cause something tells me I have a lot more things to see then :).